Queensland is a large Australian state, and within it are a number of smaller regions, including the somewhat amorphous Tropical North Queensland. Geographically it makes sense, but even the name does little to portray the real magic of this part of Queensland. It’s here where the rainforest meets the reef, as tourism officials will quickly tell you, where the ancient UNESCO protected Daintree Rainforest meets the equally ancient and protected Great Barrier Reef. It’s a wild and wooly part of Queensland, but one that quickly won my heart. It’s physically stunning, but it’s also home to any number of fun and adventurous activities that will bring you closer to some of the most amazing places on the planet. I spent a fair amount of time in the Tropical North and while there is still much more for me to see and do, I thought I’d share a few of my favorite experiences (so far) in this, my favorite region of Queensland. I love trains and scenic rail trips are always experiences I look for when I travel. One of the best in Australia is based out of Cairns and when you visit is just one of those activities you can’t miss. Running from Cairns to Kuranda, this scenic railway snakes up the Macalister Range through jungles, waterfalls and areas of the Tropical North impossible to reach by any other means. The rail line was built in the late 19th century but has been a tourist railway since the 1930s. Thanks to that history, the carriages look and feel just like the original versions, adding a vintage feel to the experience. I opted to travel in luxury though, booking the Gold Class experience on the Kuranda Scenic Railway. Enjoying drinks in the station lounge before departure, I traveled in a special luxury car with lounge-style chairs and was treated to drinks and food throughout the scenic journey. Providing ease and comfort, it made the experience even more special than it already was. While Cairns is fine, the community that really stole my heart was Port Douglas – but I can’t necessarily tell you why. Like so many other Australian towns, Port Douglas begun life in the 19th century when gold was found nearby. Life fluctuated in this small town over the years, but by the 1960s it was little more than a nicely situated fishing village. Then, in the 1980s and ‘90s, some smart developers realized the potential and starting to invest in hotels and infrastructure eventually evolving to the great beachside retreat it is today. The active heart of the community is Four Mile Beach stretching from rocky headlands, it’s a massively wide beach and is one of the main reasons why people visit in the first place. But I barely stepped foot onto that beautiful beach. No, instead I was much more interested in the town and community itself. Maybe it was the tree-lined street or the pastel colors of the buildings, but everything had a design to it, a look that was more elegant than normal. It was the kind of community where I could see myself vacationing, relaxing at a coffee shop or just going for a walk. Crazed drunken 20-somethings were nowhere to be seen, no backpackers could be found and instead professionals, couples and families crowded the sidewalks. It was nice and maybe as I get older I appreciate these enclaves of civility more than I ever have before. There’s a time and a place for everything, and drinking contests and half-naked people aren’t for me anymore. No, instead when I relax I want to actually relax in a peaceful and calm environment and for me at least, that’s what Port Douglas was all about. I’ve done a lot of zip lines all over the world, from the highest, the fastest, the longest – you name it. They’re experiences I enjoy and usually offer great opportunities to see places you’d never get to experience otherwise. I was surprised though to learn that in the barely inhabited wilderness area of Cape Tribulation is one of the most unique zip line tours in the world. Jungle Surfing Canopy Tours take guests on a series of zip lines through the UNESCO World Heritage protected Daintree Rainforest. One of the oldest tropical forests in the world, these jungles look like scenes from Jurassic Park instead of a quiet park in Northern Queensland. So what makes this zip line so unique? The fact it exists at all is fairly phenomenal, building in UNESCO sites isn’t the easiest thing to do, especially in an area without electricity or running water. The entire trail was constructed essentially by hand and done in ways that aren’t only sustainable, but culturally sensitive to the indigenous peoples who call this jungle home. The result is a wild and fun experience that includes easier, slower lines for novice fliers to the final zip line, which is one of the fastest you’ll find anywhere. It’s a great adventure experience and a fantastic way to get into the rainforest and to enjoy its beauty close up. More than just a great luxury resort, Silky Oaks Lodge offers an experience nearly impossible to find anywhere else in the world. Occupying an enviable space adjacent to the UNESCO World Heritage protected Daintree Rainforest and Wet Tropics region, Silky Oaks has incorporated all the best elements of the jungle into its refined and private luxury experience. Silky Oaks is made up of a series of small cottages that they call tree houses. Perched high on hills overlooking the jungle or nearby river, the tree houses offer a secluded and luxurious experience for every guest. Silky Oaks has also done a great job of embracing its natural surroundings by offering walks through the forest, a private swimming hole, kayaking on the hotel’s river and a spa that is one of the best I’ve ever been to. There is no choice in my opinion; Silky Oaks must be on your to-do list if you’re an admirer of luxury hotels and resorts as I am. While not typically known for their culinary prowess, Australians do love their sweets and the unique flavors of the homemade ice cream here were some of the best I’ve ever sampled. 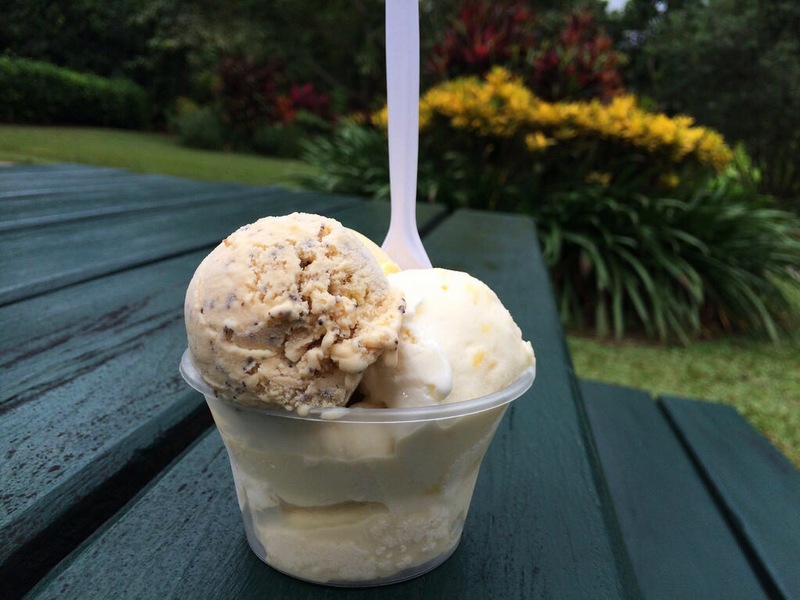 The ice cream is all made on site from tropical fruits grown on the property. That means that the flavors change by season, and there are usually only 4 of them on offer. When I visited the flavors included: pineapple, mango, soursop and wattleseed. A little unusual, so I went with the sampler cup to try them all. The ice cream was rich and creamy and as it turns out the soursop was my favorite. It was a fun way to cap off an amazing day exploring this lush, tropical area and to cool off in the always hot and humid weather. No, going in a cable car is not in itself an adventurous experience. Is it fun? Yes, no doubt there, but the only element of danger is hitting your head as you get in the cars. But this particular operator does include an option for the intrepid traveler that is certainly a hair-rising and adventurous way to see one of the most beautiful rainforests in the world. In addition to the normal cars and even all-glass cars, the Skyrail Cableway also offers something they call the Canopy Glider. Harkening back to the days when fearless souls built the railroad that still traverses this wilderness area, the glider is an open-air gondola that offers amazing views and a one-of-a-kind immersion to the beauty of the rainforest itself. Accompanied by a ranger who explains the sights as you soar more than a thousand feet above the ground below. It’s one thing to be that high in an enclosed car, but it’s an entirely different experience to suddenly have those walls removed with nothing separating you from the landscapes all around. I was a little dubious as I drove up to the Wildlife Habitat in Port Douglas; it didn’t necessarily look like a reputable animal care facility, but luckily those first impressions were very wrong. It’s not a zoo, as the staff will quickly remind you, instead it’s meant to be a wildlife immersion experience. Committed to rescuing and preserving native species, the habitat takes in hundreds of sick or injured animals every year before releasing them back into the wild. Visitors can get a firsthand look at these efforts by joining a special wildlife care behind the scenes tour. Led by one of the expert keepers, guests literally get to go behind the scenes to see some of the animals housed at the habitat, visit the clinic where they’re treated and learn more about the width and breadth of wildlife found in Queensland’s north tropics. The tour also includes a normal walk around the enclosures – immersive habitats that painstakingly recreate the ecosystems from which the animals come. From cuddly roos to the elusive Southern Cassowary, it’s one of the best ways I’ve seen at both showcasing and preserving animal species anywhere in the world. The Tropical North of Queensland is a vast area characterized by the state’s greatest attributes, the rainforest and the reef. The ancient Daintree Rainforest runs the length of the northern reaches of the state, right next to the beach in most cases. It’s from those beaches where thousands access the massive Great Barrier Reef every year, giving rise to the slogan Rainforest to Reef. It’s more than a clever tourism saying though; it’s the truth and is just one attribute that makes traveling around the Tropical North so much fun. For me that enjoyment started almost as soon as I left Cairns, passing by near perfect stretches of sandy beaches, stopping off along the way to pinch myself that these were just the “ok” beaches in the hierarchy of Queensland’s tropical retreats. Anywhere else in the world, and they’d be tourist destinations in their own right instead of rest stop backdrops. It was a peaceful and pleasant drive, and just reinforced my belief that renting a car in Australia isn’t just nice, it’s a necessity if you really want to get out and explore.